Robin, When are you coming to do a book tour? Nothing fixed yet–book tour wise–Amy. We hope to come to the States late January. Thanks for the heads up! I will be ordering soon. 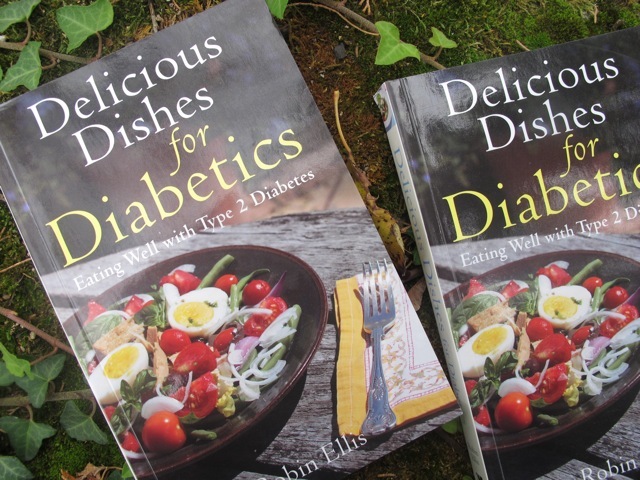 Although I am not a diabetic, I have a pancreatic problem that restricts my fat intake. When on any kind of special diet it is very easy to get in the habit of cooking the same things, I am hoping this book will help give me some new ideas for interesting and different menus. I have appreciated the recipes on the blog too! I hope the book helps Elizabeth and you find something different. Thanks Athena–that’s one of my favourite recipes–a one pot wonder! Congratulations and I know it will be a stunning success everywhere! Love the red, white and blue HOORAY! My warm congratulations Robin for USA’s launch!!! on November 2, 2011 at 11:22 am | Reply Dianne P.
Congrats, Robin!! I’ve been torn between wanting to buy the book in advance or waiting to buy it from whatever store you might be at in NY. Not sure if they’d like me coming with a book already; I’m sure they’d like to make the sale themself? Congratulations on the book. Newly diagnosed myself, I am looking forward to cooking from it, everything looks delicious. Hopefully if you do a book tour, San Francisco will be on the list. Thanks Donna–we are hoping to visit SF in the New Year.